The toilet itself has two sections, one for waste and the other containing the flushing mechanism and seat. The tank can be sealed for easy transport and unlike some portable toilets, it is suitable for users up to 28 stone or 182kg. 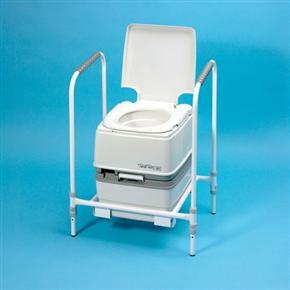 The performance of a chemical toilet also depends on the chemicals used. We can supply this with Aqua Kem to keep odours to a minimum, or Aqua Rinse for easier cleaning. Height adjustable and can be dismantled and packed for storage or transport. This chemical toilet is fantastic!! I bought it for my elderly mum who lives me and my family. We didn\'t want a conventional commode in the back room of our house with the \'odors\' that can go with such equipment! Nor did I really want to be emptying it every time it was used throughout the day. So we thought this item might be a better option and it is working out really well. The toilet when used with the stand is a great height (which is adjustable), its very strong and safe and the chemicals really do prevent any unpleasant odors!! The toilet actually smells really fresh and clean and the flush freshens and cleans the bowl very well - much to my surprise to be honest!! Its an excellent solution for anyone needing more accessible toilet facilities without the upheaval and cost of major plumbing work!! Very good,delivery following day,and all in good condition. Many thanks,will use you again.